Nostalgic memories of the days when railways flourished with passenger and goods services on main and branch lines. 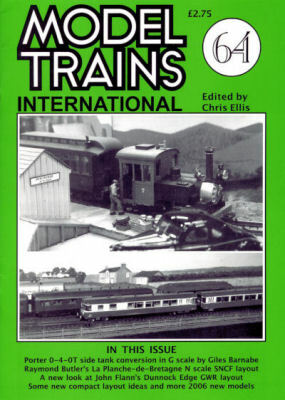 A "classic' GWR branch line in OO describing its setting, operating scheme and locos and stock employed. A simple but very effective French N branch terminal layout using a prototype as inspiration. The concluding part (see 61/179, 62/206) about an American HO switching layout with track plan, describing its scenic treatment and structures. How to alter the LGB 'toy' loco into an American version. A report on this alternative magnetic coupling for OO. A novel and adaptable method to support a baseboard using Contiboard. How to adapt Bachmann/Model Power bogie flat wagons to carry containers. A first attempt descibed of building and operating an American N switching yard. How to build a highly detailed structure flat of an actual American lineside industrial building in HO. A design for a dockside railway inspired by a diorama. A combined Inglenook and Timesaver layout in multi-mode.